There is much more to ramen than cheap instant-soup packets. 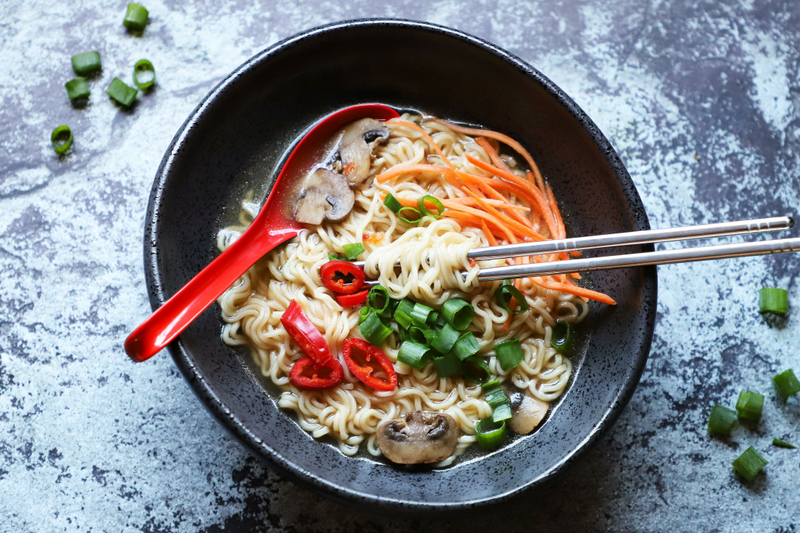 This quick-and-easy vegan ramen noodle soup has layers of flavor. Pressure cooking broth with garlic and ginger infuses extra flavor, while chili paste and soy sauce bring the authentic umami to your soup bowl. And you get all of this in about 20 minutes thanks to your pressure cooker! Top soup with carrots, green onion, sliced chile peppers, and chopped fresh cilantro to serve. Don't use soy sauce? Substitute coconut aminos instead! Get creative with your ramen toppings! Some suggestions include tofu, baby bok choy, bean sprouts, and cabbage. Per Serving: 125 calories; 6g fat; 14.7g carbohydrates; 4g protein; 0mg cholesterol; 1513mg sodium. These ramen noodles give me life! The broth was really delicious, not salty at all. I added a ton of vegetables to mine and also a soft boiled egg. It was amazing! I've always loved ramen noodles, especially in college. But this version is "grown up". I had trouble finding white miso paste at my local grocery store, so opted not to use it. The soy sauce and vegetable stock together still gave it great flavor. The peppers, mushrooms, and onions were my favorite part. It's healthy food but also comfort food, I love that. This ramen soup is so delicious, and the broth is very soothing! I've made this a couple times, that's how much I love it. The first time I pressure cooked it for 1 minute, but accidentally left in the pot on "Keep Warm" for a few minutes so the noodles were softer than I like. But the other times I made it, I released the pressure immediately and the noodles were perfect. This recipe is amazing with tofu! I also added cabbage and bean sprouts. I'm loving the use of low sodium broth too. 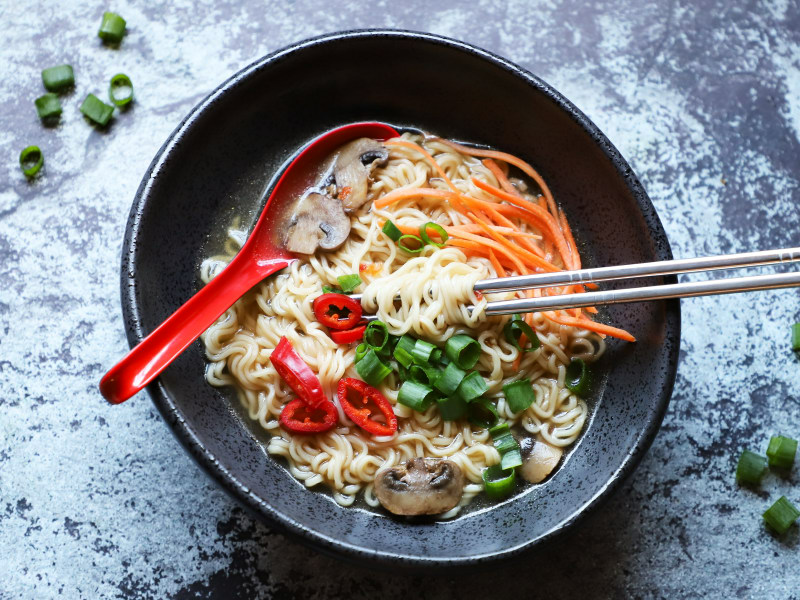 It's a perfect recipe when you're craving a quick and healthy ramen. I cooked Mongolian beef meatballs separately in a skillet and added them to this ramen. The noodles came out perfect. My husband was afraid they would be complete mush, but they didn't! This was pretty tasty! Had just enough heat. I don’t care for real spicy stuff. I did t have enough rice vinegar so I used apple cider vinegar. Needs more veggies, a good base to build from. I know this is vegetarian ramen, which is why I feel it lacks the deep flavor I’m used to with traditional ramen made from a pork base. One, the recipe doesn’t tell you what to do with the mushrooms. I added them with the ramen at the end along with 2 teaspoons of thyme and it came out ok. I’d recommend sautéing them in the beginning and definitely including thyme. It needs more umami flavor which you don’t get with the base ingredients here. I’m going to stick with traditional ramen. I wanted to try this because I was eating vegetarian for the month. Very easy to make. First it doesn’t say to add the mushrooms with the ramen, but I assumed. I think this recipe would benefit from thin sliced pork or chicken, some kind of protein. Also found it a bit salty, and I used low sodium soy sauce. Thought flavor was good but mushroom instructions left out. I sautéed the mushrooms and added sliced carrots to broth. What about other veggies or protein?? Next day leftovers absorbed all broth.. soggy noodles.. The noodles soaked up all of the broth. The broth had great flavor I just wished there was more of it. Next time I will use less noodles and possibly use different noodles that won’t turn to mush when reheated. I added extra chili paste and a chopped up cilantro for more spice and it had a really nice spice to it. I also added shredded carrots, bok choy, and bell peppers. I can’t wait to try it again with a few changes.